Each week, as you know, we’ll be looking at a different silent Hitchcock – and this week we have arrived at The Lodger, a bona fide Hitchcock thriller, yet only the third feature he directed. The film he made before this and after The Pleasure Garden, The Mountain Eagle, is sadly a lost film. 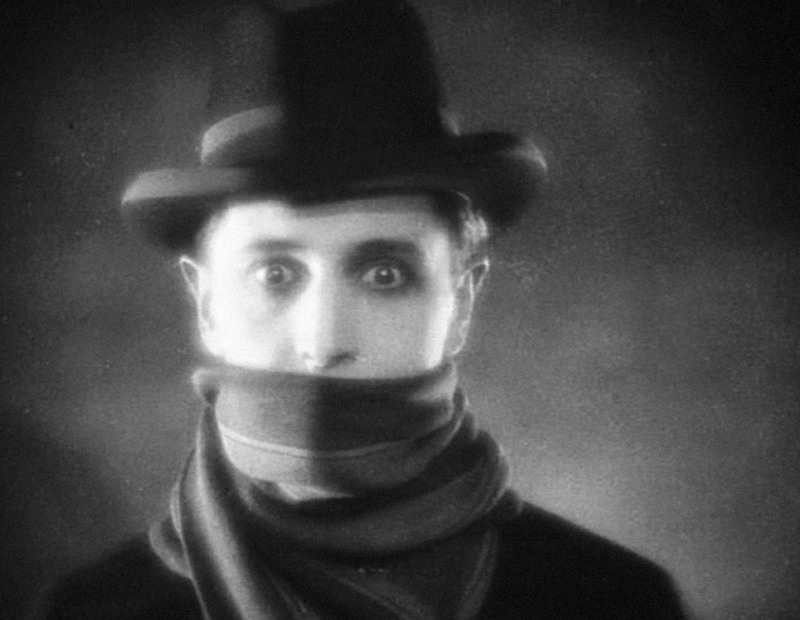 The Lodger is a wonderfully atmospheric “is-he-or-isn’t-he?” intrigue starring Ivor Novello as a man suspected of being a serial killer – a ripper who calls himself the Avenger and targets pretty blonde women. 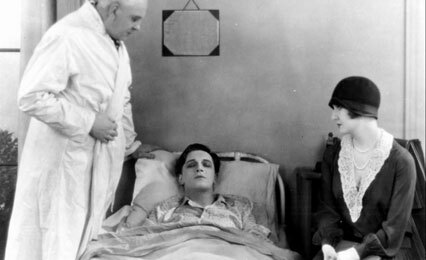 Heralded as an early classic and praised for its Expressionist flourishes now, The Lodger was almost never released following a damning assessment by a distributor at an industry screening. Michael Balcon and Film Society member Ivor Montagu both went to bat for the film and after the addition of some elaborate intertitles, The Lodger was finally released, pleasing critics and audiences alike. The Bioscope praised it, saying: “It is possible that this film is the finest British production ever made”. 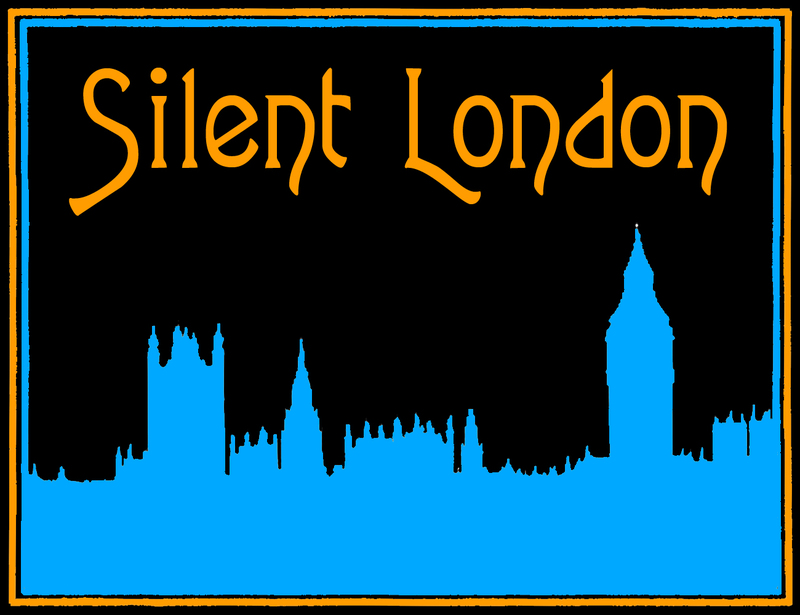 The film bears the evocative subtitle “A Story of the London Fog”, but the peasouper here is really a miasma of suspicion, temptation and guilt. To varying extents, the lodger’s landlord and lady (the Buntings) suspect him of being the killer, as do their daughter Daisy and her steady policeman boyfriend, but still they welcome him into their home. When Daisy first kisses the lodger, she does so with open, watchful eyes. When Mrs Bunting sees some cash on his mantelpiece, her mind immediately turns to theft. Does she not even trust herself? It’s a grimy, nasty film in so many ways, but there’s humour here of course, most notably in the gallows mode from the wearily pragmatic dancing girls who crowd round the paper to read about the latest murder then go out with brunette ringlets tucked in their hats as a precaution. Hitchcock has said that he was forced to drop his preferred ending for the film and The Lodger‘s final moments are from convincing. It’s not as audacious as Murnau’s tacked-on happy ending for The Last Laugh (1924), but knowing that Hitchcock saw that film goes a long way to explaining the tone of the final scene. Hitchcock moment: Three minutes in, Joe initiates a very ghoulish conversation over tea, but is interrupted by something apparently terrible happening upstairs. Watch out for: Hitchcock’s first cameo, as a newspaper editor. The Lodger screens at the Barbican on 21 July 2012, with the London Symphony Orchestra performing a new score by Nitin Sawhney. The film will then be theatrically released on 10 August 2012. More information here. Don’t forget that you can still donate to the For the Love of Film Blogathon, to get The White Shadow streamed online with a new score, if you can, please spare some cash for this good cause.